The riser is a large diameter pipe that runs from the platform or drill ship to the seabed in the drilling of offshore wells, and within which lowers the drill pipe, tools, hoses, pipes, cables etc required in the well drilling. Drilling mud and cuttings from the well back to the surface through the riser. The top of the riser is subjected to the drillship (or barge drilling), while its bottom is secured in the seabed. 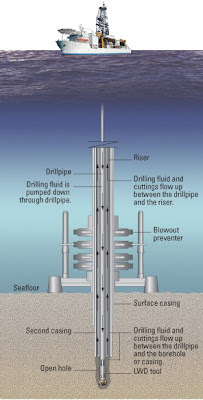 A blowout preventer (BOP) posted on the Marine base between the well and riser provides protection against overpressured formations and sudden releases of gas that may occur. The diameter of the riser usually up to 21 inches (53.3 cm approximately) that is broad enough to allow the drillpipe, logging tools, and multiple casing strings passing through it.